It’s funny how your perspective can change. Allen Jacobson and his wife, Lila Daut, were dyed-in-the-wool sailors — Lake Michigan multihull cruisers and racers with a resume full of weeknight and long-distance regattas in their Corsair and Farrier trimarans. The excitement of competition, the boat-handling and navigational skills it demanded — this was the fun of sailing. Jacobson, a 73-year-old investment adviser in Madison, Wis., says it was time for a different kind of boating — and a different kind of boat. Sailing was getting to be hard work. 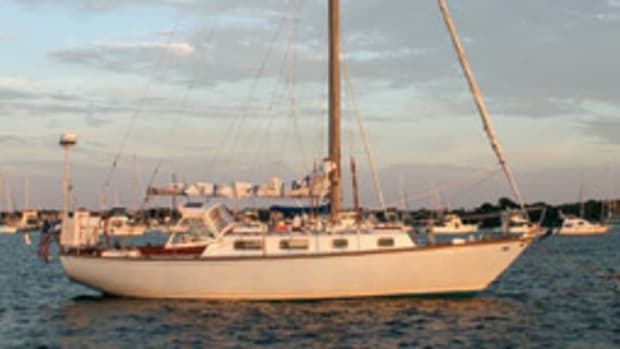 “We knew we wanted to do some serious yet comfortable cruising, and a trimaran with two 5-gallon water jugs and a cooler was definitely not the answer for us,” he says. 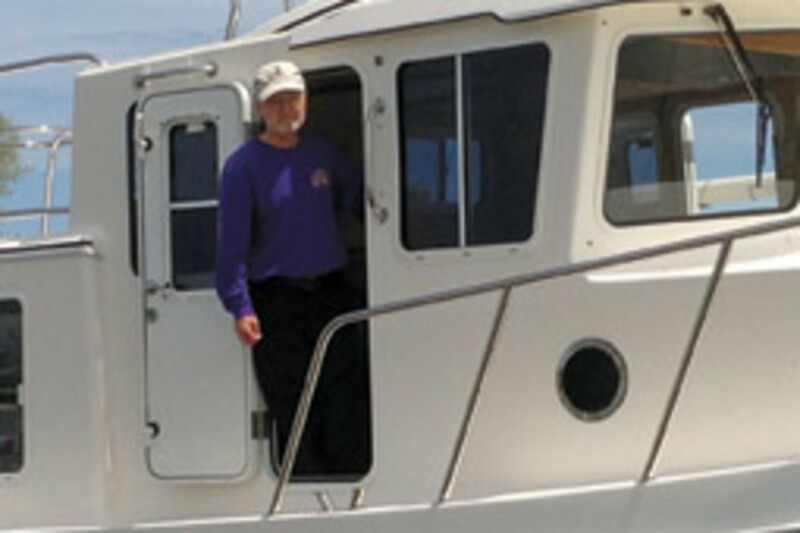 The couple decided in the fall of 2012 to make the change to a powerboat. 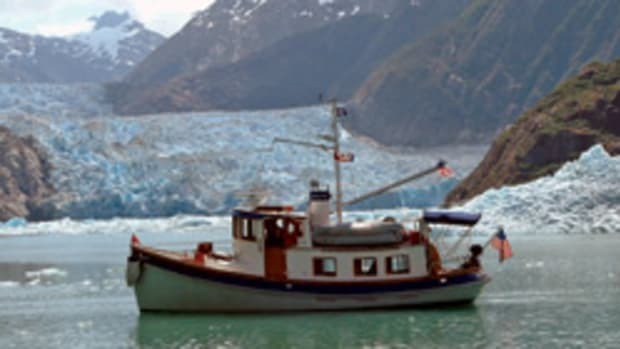 Trawlers seemed the natural way to go, and a trip to Trawler Fest Seattle that year exposed the two to a fleet of them. One boat in particular caught their eye: the American Tug 34, a single-engine, single-stateroom model. “At first, they all looked the same,” Daut says. By the end of the second day, they were drawn to the American Tug line of trawlers from Tomco Marine Group, the LaConner, Wash., builder. “From the seaworthy construction to the space and layout to the beauty of the lines,” she says. The 13-foot beam provides room in the saloon for a galley-up. “We can both be involved in meal preparation without bumping into each other,” he says. “We’ve been surprised to find just how pleasant it is to be motoring along out in Lake Michigan hour after hour,” Jacobson says. “Shaking up a cocktail with a generous supply of ice cubes from your freezer, gathering up some fresh vegetables to sauté from the cool drawer in the bottom of the lazarette and broiling a whitefish in the oven — these are ordinary things of life that are made so pleasurable by looking out large windows at a secure and scenic anchorage with the sun sliding low in the sky. 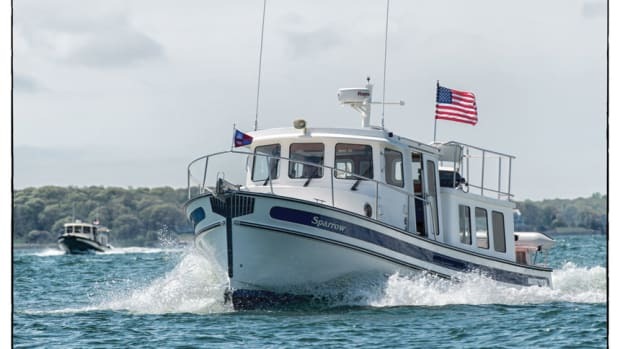 The Powerboat Guide calls Tomco Marine’s American Tug 34 a “sought-after coastal cruiser … loaded with practical features.” It starts with the pilothouse design. 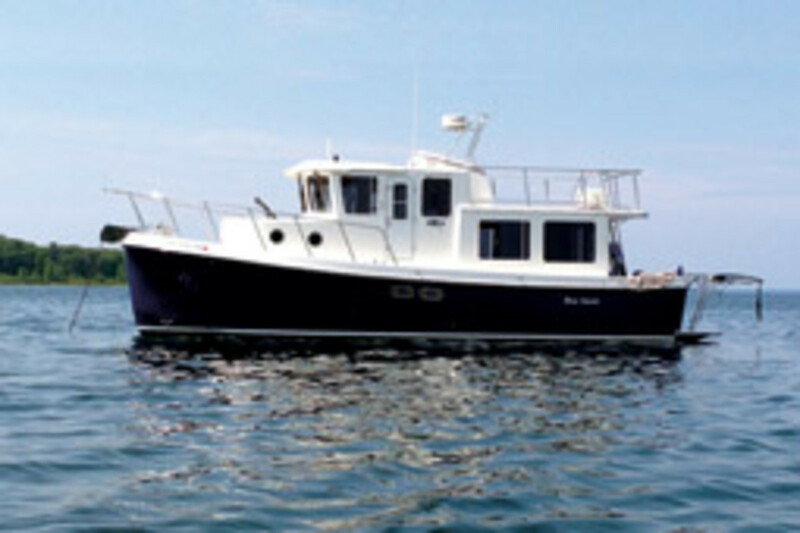 The steering station is to starboard behind an ample, sturdy trawler-style windshield, with side doors to access the decks. The high bulwarks make moving around the boat safe and secure. The single-stateroom layout below begins with a large master cabin forward, laid out with a queen-size island berth and direct access to the head compartment, which is designed with a large separate shower stall, along with the usual amenities. Up three steps is the pilothouse. The helm station has good sightlines for docking or picking up a mooring, ample room for charts and electronics, and bench seats for comfort. The L-shaped galley-up is aft in the saloon, to starboard. Standard equipment includes a double-sink, a three-burner stove and an oven, along with a refrigerator/freezer unit and a microwave. The L-shaped lounge along the port side converts to a double bunk. The cabinetry below is finished in teak. 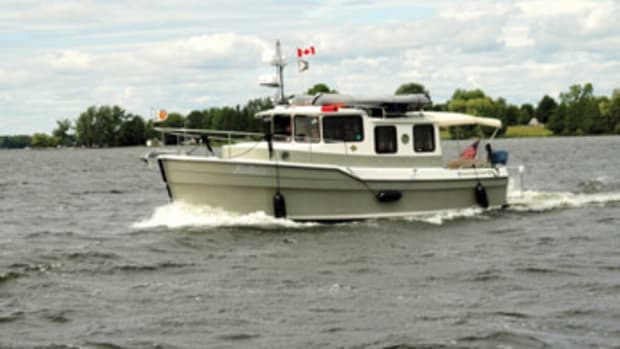 Power comes from a standard Cummins 330-hp diesel, accessed through the pilothouse sole. 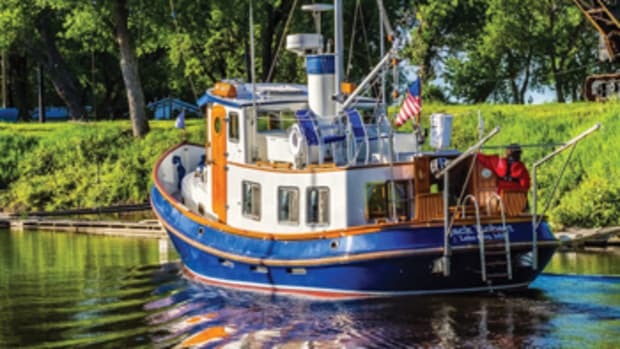 Tomco Marine, the LaConner, Wash., builder of the American Tug 34 and its sisters, was founded in 2000 during discussions between Pacific Northwest trawler maven Tom Nelson (Nelson Yacht Corp., Nordic Tugs) and well-known trawler designer Lynn Senour. 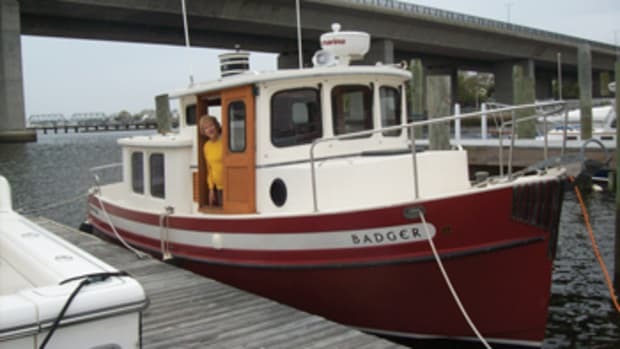 The idea was to draw on the region’s strong fishing heritage and rugged commercial craft to create tug-style cruisers for the recreational market. 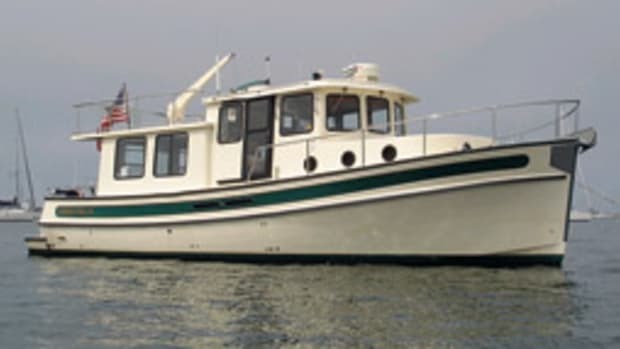 The American Tug 34 debuted to critical acclaim in 2001 and stayed in production for more than a decade. 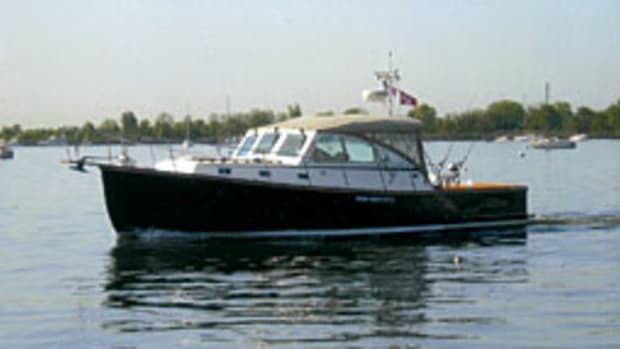 On the used market, early models are being offered for about $180,000 to $200,000; newer boats list for $250,000 to $300,000. Although the 34 has been retired, the builder has expanded production to include four current models: the 365, 395, 435 and 525. BUILDER: Tomco Marine, LaConner, Wash.
You can’t get much closer to the water than you do in a kayak. That kind of one-on-one feeling is what got Vickie Silvia started on boats.